A water based epoxy coating for low odor applications. 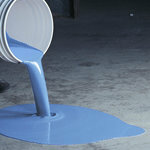 Good cost effective option for coating large areas with epoxy strength . Gives off a satin finish for anti-glare. Pre-measured components in a 2 gal kit for easy application. Components include: 1-1/2 gal Part A (resin), 1/2 gal Part B (hardener) - volumes approximate. Tigerskin™ is approved for shipping to all 50 states by ground or air.